Oh man, I can't tell you how much this fence has been stressing me out. But the posts! 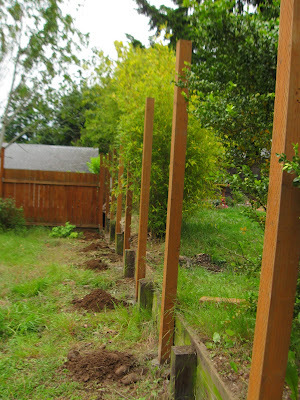 The posts are in! There's a whole new issue because of the dramatic elevation change that takes place as you move toward the far neighbor's house but I'm not going to talk about that now. I'm going to vacuum my basement and go to my happy place. What, you don't vacuum your basement when you need to clear your mind? Weirdos. I'm apparently worse at math than I thought.